In the 1990s, during the unending economic crisis known as the “special period in time of peace,” foreign investment became an important factor for Cuba. Not only did foreign investors provide badlyneeded capital inflows, but they also provided management know-how, technology, raw materials, and markets for goods and services produced in the island. 1 It is no coincidence that the sectors of the Cuban economy that have performed best in the second half of the 1990s and early 2000s—tourism, oil, nickel—have had significant participation by foreign investors. The amount of information available on foreign investment in Cuba is very limited. This is in part the result of a deliberate Cuban government policy to maintain a veil of secrecy over investment flows in order to protect foreign investors from U.S. sanctions. It may also reflect the overall lack of transparency that characterizes the operation of the Cuban government and the desire to improve the investment climate by giving the impression that foreign investors are queuing up to invest in the island. This lack of information hinders efforts to better understand the current situation of the Cuban economy and its prospects. To contribute to filling this information gap, the author has created a database of foreign investments in Cuba relying strictly on publicly-available information. The creation of the database has been supported by the Cuba Transition Project (CTP) of the University of Miami; the database is currently maintained by the CTP and is available to researchers and interested parties at the CTP website (more on this below). Although the information gathered in the database by no means answers the multitude of questions about foreign investment in Cuba, and many caveats apply, it does make a modest contribution to understanding the nature and pattern of foreign investment. The purpose of this paper is to provide an inventory of foreign investment in Cuba based on the information collected in the database. Before discussing the structure and contents of the database, the paper describes briefly the forms of foreign investment that Cuba permits and summarizes available information on the stock and flows of foreign investment. The paper then describes the methodology underlying the database and presents some summary statistics on foreign investment in the island based on the contents of the database. The paper concludes with some caveats regarding the use of the database and suggestions on how to enhance its utility to researchers. This paper concentrates on the contents of the database, and leaves for another paper a description of the search functions built into the system. Foreign investment is a relatively new phenomenon in revolutionary Cuba. After nationalizing properties owned by foreign investors in the early 1960s and foreswearing foreign participation in the economy, in 1982 the Cuban government passed a law (Decree- Law No. 50) that for the first time permitted foreign investment in the island, although only in the form of joint ventures between foreign and Cuban enterprises. Despite enactment of this law, Cuba’s efforts to attract foreign investment in the 1980s were largely unsuccessful, with the situation beginning to change in the early 1990s when there were some breakthroughs in the tourism and nickel mining sector. In September 1995, Cuba substantially revised and updated its legal framework for foreign investment. The Foreign Investment Law (Law No. 77 of September 1995) is currently the main legal instrument governing foreign investment in Cuba.2 According to its Article 12, three types of foreign investment are permitted: (1) joint ventures; (2) international economic associations; and (3) wholly foreign-invested companies. Law No. 77 also has some sector-specific provisions that are relevant to our discussion. Joint ventures (empresas mixtas), formed between one or more Cuban entities and one or more foreign partners, have legal personality independent from that of the constituent parties (Article 13). The basic documents creating a joint venture are the agreement of economic association and the bylaws that govern the venture’s operations. The proportion of capital to be provided by the foreign and the national investor or investors are agreed upon by the partners in advance and defined within the basic documents; profits earned by the joint venture are distributed to the investors according to ownership shares. The Cuban party must be guaranteed participation in the administration or joint administration of the enterprise. Joint ventures must be approved on a case-by-cases basis by the Cuban government, either by the Council of Ministers or by a lower-level commission, depending on the amount of capital and the nature of the economic activity involved. International economic association contracts (contratos de asociación económica internacional) are subscribed between one or more Cuban entities and one or more foreign partners, typically for a specified purpose (Article 14). Unlike joint ventures, international economic associations do not have legal personality independent from that of the constituent parties. Further, although each party makes a contribution to the association (e.g., land, machinery, technology, raw materials), the contributions are kept separate. The parties agree on a formula for sharing the profits from the association. • Cooperated production contracts (contratos de producción cooperada): These contracts may be either for the production of goods or services. The foreign partner typically provides raw materials, equipment, parts, technology, and technical assistance to support production in Cuba of goods or services that may be sold domestically or exported. The contracts must be approved by the head of the Central State Administration Agency to which the local contracting party is attached. • Management contracts (contratos de administración productiva o de servicios): In these transactions, a domestic entity contracts with a foreign company to manage one or more production lines or an entire facility in Cuba for a specified period of time in return for a pre-determined remuneration; typically, the remuneration is a function of the related to the performance of the manager. The foreign partner usually contributes know-how, technology, and markets. Although management contracts in theory may be negotiated in any sector of the economy, they have proliferated in the tourism industry. Hotel management contracts must be approved by the Ministry of Tourism; management contracts in other economic sectors must be approved by the Ministry of Foreign Investment and Economic Cooperation. Wholly foreign-owned companies (empresas de capital totalmente extranjero) are also contemplated by Article 15 of the Foreign Investment Law. Under this form of investment, the foreign investor manages the company, reaps all the profits, and is responsible for all taxes and other payments. The legal framework for foreign investment set out in Law No. 77 applies to all sectors of the Cuban economy, with the exception of health and education services and institutions of the armed forces, other than commercial activities of the armed forces3 (Article 10). Article 16 clarifies that investments are allowed in the following forms of real estate: residential housing for non-residents or for tourists; residential or commercial units for foreign companies; and tourism facilities. Official quantitative information on foreign investment stocks and flows are scarce and inconsistent. The lack of transparency on the part of Cuban authorities regarding incoming investment is officially attributed to concern that the U.S. Government, as part of its economic sanctions against Cuba, would use the information to punish foreign investors in the island, or to discourage those businessmen who are considering investing in the island. However, it may also reflect an interest on the part of Cuban authorities to give the impression that investment flows are more significant than they actually are, creating some competition among prospective investors, and improving the overall investment climate. The only available official statistics on flows of foreign investment are those published in Cuba’s balance of payments statistics. For the period 1993- 2001, the only period for which these data are available, annual investment flows fluctuated significantly, from $563.4 million in 1994 to only $4.7 million in 1994.8 Over the entire period 1993-01, cumulative foreign investment was $2.108 billion. Although Cuba has not published balance of payments statistics for 2002,9 a Cuban economist has reported that foreign direct investment in 2002 amounted to $100 million.10 Adding this latter figure to cumulative investment flows for 1993-2001, yields foreign investment of about $2.2 billion for the ten-year period 1993-2002. One way to reconcile the very high foreign investment stocks levels reported by Minister Lomas with the substantially lower levels of foreign investment flows in the balance of payments statistics is to distinguish between foreign investment intentions versus actually realized investment. Minister Lomas reportedly stated in November 2002 that foreign investment between 1990 and 2002 amounted to $5.4 billion, of which approximately $2.65 billion (about 49 percent) had been delivered.11 The latter figure is more in line with investment flows data from balance of payments statistics. Two other sources of Cuban foreign investment statistics are the U.S.-Cuba Trade and Economic Council (USCTEC) and the United Nations Conference on Trade and Development (UNCTAD). USCTEC has compiled the amount of announced, committed, and delivered investment in Cuba from 1990 through March 20, 1999, by private sector companies and government-controlled entities from various countries. According to the USCTEC, $6.119 billion in investments were announced over this period, of which $1.767 billion (29 percent) had been delivered. 12 The countries with the largest realized investments in Cuba were Italy ($614 million), Canada ($600 million), and Mexico ($450 million). Foreign investment statistics for Cuba in UNCTAD’s annual World Development Report are significantly different from official Cuban statistics or those compiled by the USCTEC. Thus, UNCTAD reports Cuba’s stock of foreign direct investment in 2003 at only $78.9 million,13 a figure that is at odds with other available figures. Cuba does not publish official statistics on the number of investment projects either by country of origin or by economic sector. However, Cuban analyst Pérez Villanueva14 has reported information from the Ministry for Investment and Economic Cooperation (MINVEC) that shows the number of new investment projects (apparently mostly joint ventures) by key foreign partners and by economic sector for the period 1988-97. According to these figures, 317 joint ventures were established over the period 1988-97; the countries providing the largest number of joint venture partners were Spain with 62 (19.6 percent of the total), Canada with 59 (18.6 percent), Italy with 34 (10.7 percent), France with 16 (5 percent), and the United Kingdom with 15 (4.7 percent). Ninetythree joint ventures (29.3 percent) were in basic industry, including mining, 54 (17 percent) in tourism, 31 (9.8 percent) in light industry, 24 (7.6 percent) in the food industry, and 16 (5 percent) each in construction and agriculture. • By the end of 2002, there were 403 joint ventures and 270 cooperated production contracts,16 clearly showing stagnation in the establishment of joint ventures and the preference of foreign businessmen toward cooperated production contracts. Over the years, Cuban and foreign sources have reported information regarding individual investments in the island, sometimes including the value of the foreign contribution, the value of the domestic contribution, markets for the product or service provided by the international association, terms of establishment (e.g., duration of the arrangement), and some other features. Heretofore this wealth of information had not been brought together in a fashion that could be readily used by analysts and researchers. With support from the Cuba Transition Project (CTP) of the University of Miami, I began in 2002 to assemble a database of foreign investments in Cuba based on publicly-available information. The database, created using Microsoft Access software, was intended as a repository of information on foreign investment. It was also intended to be a fully searchable system, in order to make the information readily available to researchers. The CTP adapted the database to make it, and its search functions, interactive over the internet; it is freely available to users on the CTP website, http://ctp.iccas.miami.edu/ main.htm. The data elements that we have sought to collect on each investment are given in Box 1. In practice, the amount of detail available on most of the investments was very limited, in many instances only the barest minimum. This is an important caveat to keep in mind in using the database. Entries reflect a search of the literature from the early 1990s, when foreign investment began to flow into the island, to the present. Information on investment projects that have ceased to exist—because the time period for which they were authorized has run its course, because they turned out to be a commercial failure and are no longer in business, or because they were terminated for some other reason—is rarely made public. Thus, the database should be considered as an inventory of investments rather than a current list of investment projects. A second caveat is that there is very little information on the magnitude of the capital flows associated with the transactions; in the absence of such information, it is very difficult to determine whether a foreign investor’s contribution to a given project has been $50,000, $5 million, or $50 million. Information entered into the database comes from a variety of sources, among them Cuban and foreign newspapers, news cables, business/commercial publications, academic publications, speeches by Cuban and foreign officials, and press releases by foreign corporations. Particularly useful were several business- oriented publications, two that are currently being published and two that have ceased publication. The two sources currently being published, both in the United States, are Economic Eye on Cuba, a weekly publication of the U.S.-Cuba Trade and Economic Council, and CubaNews, a monthly newsletter. The two sources that have ceased publication are Business Tips on Cuba, published monthly in Cuba for many years by the National Office of the Technological Information Promotion System (TIPS), under the auspices of the United Nations Development Program (UNDP), which apparently ceased publication around 2003, and Cuba Business, a monthly newsletter published in London from 1987 until the early 1990s that carried much information on early investments in the island. • Joint ventures (JV): These entries refer to joint ventures between Cuban and foreign enterprises. They are the most numerous in the database, with 344 JV entries, and span a wide range of economic activities and investment partners. • Cooperated production contracts (CP): These entries refer to agreements between foreign and Cuban enterprises, where the foreign entity does not necessarily make a capital investment, but provides the Cuban partner with equipment, machinery, or raw materials to produce goods or services that are marketed domestically or internationally. The database currently includes 101 CP entries. • Management contracts (MC): These entries refer to arrangements whereby foreign partners manage Cuban economic facilities. The database currently includes 100 MC entries, all related to the tourism industry. • Risk contracts (RC): Risk contracts are one of the forms of contractual arrangements with foreign partners in the mining industry.18 The database currently includes 23 RC entries, all related to oil exploration. • Joint ventures abroad (JVA): The 50 JVA entries in the database represent joint ventures that Cuban enterprises have entered into with foreign partners to produce goods and services abroad. While these are not investments in Cuba, they are nevertheless included in the database since these ventures provide Cuban enterprises with access to foreign markets and can result in increases in exports from the island and profits for Cuba. JVs are the most numerous forms of foreign investment in the database, with 344 entries. The distribution of JVs by country of the foreign partner is given in Table 1.19 Spain is overwhelmingly the leader, with 101 JVs, followed by Canada with 56, Italy with 42, France with 23, Chile with 13, and the United Kingdom with 12. 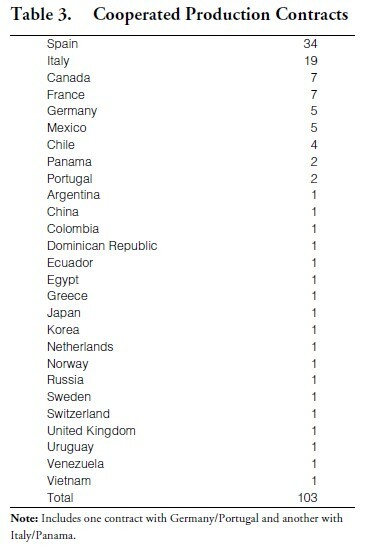 In all, the database includes JVs with entities from 33 foreign countries. Countries from the EU accounted for 203 of all JVs, or 59 percent, slightly higher than the 53 percent reported by Cuban authorities at the end of 2001. Among the JVs in the database is the one instance of a wholly foreign-owned company that we have identified: Gen Power S.A., a BOT20 joint venture established in 1999 between Genpower Cuba S.A., a Panamanian company, and Cuba’s Unión Eléctrica. According to press reports, Gen Power S.A. would: (1) finance the construction in the Isle of Youth, by German company B & W and Israeli firm Telemania, of a diesel-fired power plant consisting of 3 units of 3.5 MW each; (2) operate the plant for four and one-half years, selling the electricity to Unión Eléctrica, and receive certain payments from Unión Eléctrica for the next 8 years; and (3) at the end of this period, turn over ownership of the plant to Unión Eléctrica. The plant was scheduled to begin operation in 2000 and the sketchy information available suggests that it did begin operations at about the anticipated time and has been operating successfully since then. JVs span a wide range of economic activities (Table 2). 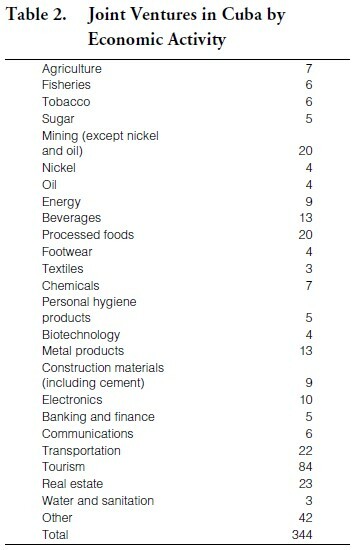 Although JVs in the tourism area predominate (84 or 24.4 percent), other economic activities with a significant number of joint ventures include real estate (23 or 6.7 percent), transportation (22 or 6.4 percent), processed foods and mining (other than nickel and oil) (20 or 5.8 percent each), agriculture (17 or 4.9 percent), and beverages and metal products (13 or 3.8 percent each). • JVs in the tourism initially concentrated on construction of hotels, marinas, and other tourism facilities. For example, the first tourism joint venture, established in 1990, was Cubacan (Cuba- Canarias), a JV between Cubanacán and Spain’s CIHSA (Corporación Interinsular Hispana S.A.). Cubacan built three hotels in Varedero—Sol Palmeras Varadero, Meliá Varadero, and Meliá Las Américas. Spanish, Canadian, and French companies were heavily involved in tourism JVs in the early 1990s. Typically, foreign and domestic investors were 50-50 partners, with the foreign partner covering the hard currency cost of the construction and the Cuban partner providing the land and labor; both parties shared in the management functions. As the tourism industry grew and consolidated, Cuba shifted to a strategy of building tourism facilities with domestic resources and turning to foreign companies only for management functions. Thus a decline in tourism joint ventures related to hotel construction and an increase in the number of management contracts with foreign hospitality companies (see below on MCs). • Real estate JVs are second only to tourism in the database: 23 JVs covering construction and sale of residential properties, condominiums, and commercial properties. In May 2000, Cuba froze new authorizations for JVs in residential housing construction and ordered those JVs that had been authorized to sell their stock of vacant apartments to the state. 21 Although MINVEC officials indicated that this was a temporary measure, real estate JVs have not been reauthorized and therefore there have been no JVs in real estate since mid-2000. • Habanos S.A., a JV announced in 1999 between Spanish company Altadis and Cuban enterprise Habanos, that markets Cuban cigars abroad. 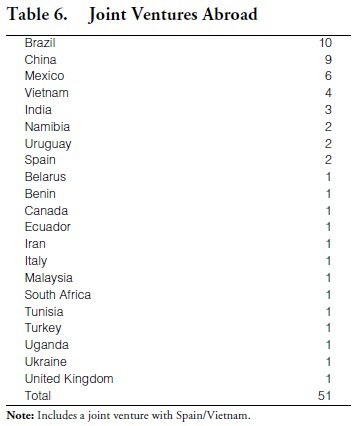 The database contains information on 101 CP contracts; their distribution according to country of origin of the foreign partner is given in Table 3. Spain was the largest source of CP contracts with 34, followed by Italy (19), Canada and France (7 each), Germany and Mexico (5 each), Chile (4), Panama and Portugal (2 each), and 18 other countries with one CP contract each. • Cuban enterprises have also concluded several CP contracts related to the assembly of electrical appliances such TV sets (CP contracts with Korea, China, and Vietnam), freezers, and refrigeration equipment for sale for dollars in the domestic market. More than two dozen CP contracts involve the tourism industry. Several of them aim at facilitating travel to the island by tourists: for example, arrangements between the Cuban flagship airline Cubana and foreign carriers to share routes and maintenance facilities, and those between Cuban and foreign entities to improve and expand airport services. Others relate to specific services demanded directly by tourists, such as duty-free shops, luggage wrapping, boat rentals, jewelry, and ice cream parlors. Still others supply goods and services to the tourism industry, thereby reducing imports and increasing the participation of domestic economic activities in the tourism industry. Among the latter are facilities that produce stainless steel cutlery for tourism restaurants and hotels, furniture and furnishings for hotels (mini-bars, safe deposit boxes, metal shelving, window blinds, climate control and electronic access systems for hotel rooms), and high quality food products for the tourist market. The database currently contains information on 100 MC, all management contracts between Cuban tourism entities and foreign hospitality companies. Perhaps more so than with other forms of foreign investment, hotel management contracts turn over frequently, and therefore it is critical to keep in mind that the information included in the database does not reflect the current structure of hotel management by foreign companies but rather the cumulative experience regarding management contracts. For example, in mid-June 2004, a management official of Jamaican hospitality firm SuperClubs announced that “we have taken our branding off of two hotels in Cuba” as a result of a controversy regarding whether the land on which one of the hotels was built had been confiscated from American owners and therefore the investor was potentially subject to U.S. sanctions under the Helms-Burton Act.24 These changes in management are not reflected in the database. The main Cuban tourism hotel companies are Cubanacán S.A., Gaviota, Gran Caribe, Horizontes, Habaguanex, and Isla Azul. Most hotel rooms suitable for international tourism (4 and 5 stars) are controlled by Cubanacán, Gaviota, and Gran Caribe, with Habaguanex concentrating on small hotels in the historic core of the city of Havana, and Isla Azul focusing on 2- and 3-star hotels for domestic tourism. Table 4 shows that industry leader Cubanacán has been, by far, the Cuban hotel company with the largest number of management contracts with foreign entities, accounting for 51 of the 100 management contracts in the database; Gaviota and Gran Caribe, with 16 and 10 management contracts, respectively, lagged behind Cubanacán. 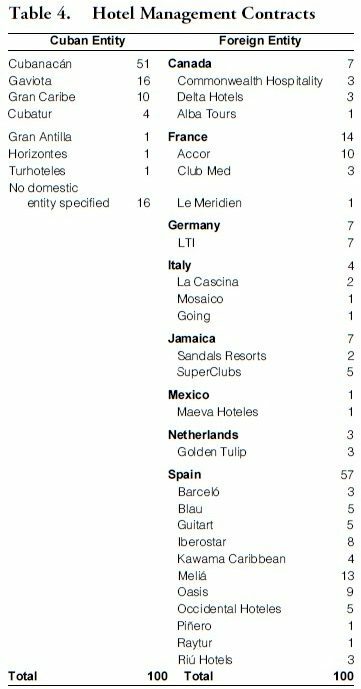 • Spanish hospitality companies have led the way in this area with 57 MC; among the Spanish companies, Meliá has been the most active, with 13 contracts, followed by Oasis (9), Iberostar (8), Blau, Guitart, and Occidental Hoteles (5 each), Kawama Caribbean (4), and Barceló and Riu Hotels (3 hotels each). Other Spanish hospitality companies that have managed hotels in Cuba include Piñero and Raytur. • French hospitality companies have had MC for 14 hotel properties in Cuba, with Accor leading the way with contracts for 10 properties, Club Med with 3, and Le Meridien with 1. • Hospitality companies from Canada (Commonwealth Hotels, Delta Hotels, Alba Tours), Germany (LTI), and Jamaica (Sandals and Super- Clubs25) each had seven MC. • Hospitality companies from other countries with MC included Italy (2 for La Cascina and 1 each for Mosaico and Going), the Netherlands (3 for Golden Tulip), and Mexico (1 for Maeva Hoteles). 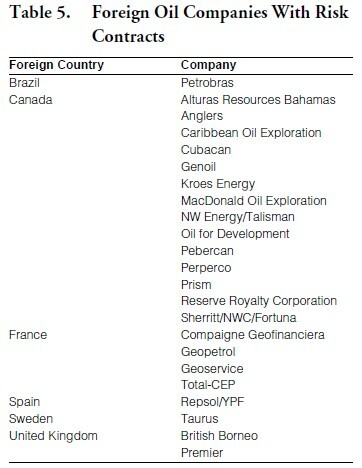 Table 5 lists the foreign oil companies that have concluded risk contracts with Cuba, according to the information in the database. In all, 23 such risk contracts have been negotiated since 1990. Small, independent Canadian oil companies have been the most active in Cuba, with 14 of them winning bids to explore for oil inland or offshore, and entering into risk contracts with Cuban oil monopoly Cubapetróleo (Cupet). One of the Canadian corporations, Sherritt, has actually been quite successful in its Cuban operations and is currently Cuba’s largest oil producer. The database also contains information on 50 joint ventures established abroad between Cuban entities and foreign partners (Table 6). The largest number of such joint ventures abroad is with Brazil (9 joint ventures), followed by China (9), Mexico (6), Vietnam (4), India (3), Namibia, Spain, and Uruguay (2 each), and thirteen other countries (Belarus, Benin, Canada, Ecuador, Iran, Italy, Malaysia, South Africa, Tunisia, Turkey, Uganda, Ukraine, and the United Kingdom) with a single joint venture. • three joint ventures between Cubanacán and foreign enterprises to build hotels in: (1) the Pudong district of Shanghai, China; (2) the Riviera Maya, Cancún, Mexico; and (3) Lanzarote, Canary Islands, Spain. The latter two investments also have the involvement of Spain’s Meliá, the company that will manage the properties. 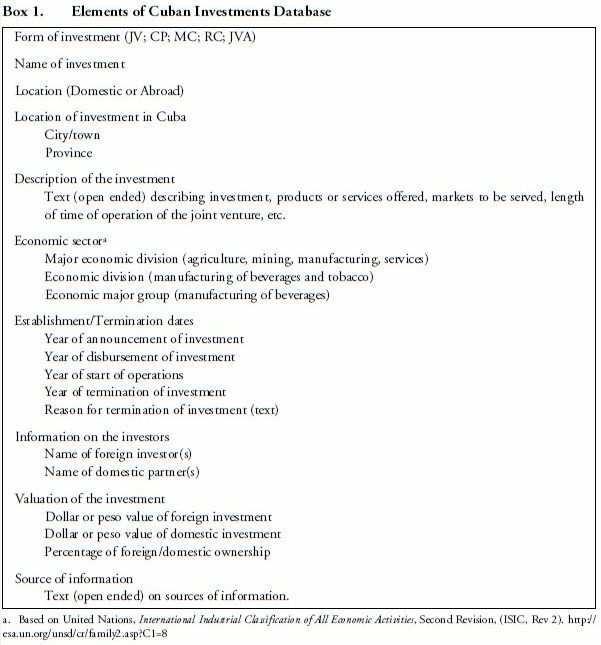 The foreign investments database described in this paper, when used together with information from other sources, can be a useful tool to analyze economic developments in Cuba. While the database currently contains a significant number of entries (618 investment projects), the amount of information on most entries is quite sparse. A major challenge to making the database more useful to analysts is to further populate it by adding details about the entries from sources that heretofore have not been available to this author. The author would be pleased to receive information that adds or corrects existing information on investments. As has been stated above, one of the known weaknesses of the data on investments is the lack of information on the termination of investment projects. Improvement in this area and others would make a significant contribution to the usefulness of the database. 1. For a discussion of the benefits that Cuba derives from foreign investment, see, e.g., Omar Everleny Pérez Villanueva, “La inversión extranjera directa en Cuba: Evolución y perspectivas,” in Cuba: Reflexiones sobre su economía (La Habana: Universidad de la Habana, 2002). 2. It should be noted that foreign companies may set up sales, distribution, or services offices in Cuba. Such actions do not entail an investment and often do not require participation by a Cuban partner. They typically operate as sales offices, from which goods and services are sold (in hard currency) to the government, to foreign-invested enterprises, or the general population. In 2002 there were over 800 Cuban branches of international companies operating in Cuba. See Matías F. Travieso-Díaz and Charles P. Trumbull, “Foreign Investment in Cuba: Prospects and Perils,” Cuba in Transition—Volume 12 (Washington: Association for the Study of the Cuban Economy, 2002), p. 182. 3. This is an important exception. As will be discussed below, tourism company Gaviota, controlled by the Armed Forces, has a significant number of joint ventures and management contracts involving hotels and tourism facilities. 4. For the sources for these statements see Jorge F. Pérez-López, “Foreign Investment in Cuba,” in Archibald Ritter, editor, The Cuban Economy (Pittsburgh: University of Pittsburgh Press, 2004), p. 151. 5. Juan Triana Cordoví, “La Economía Cubana en el Año 2000,” in La Economía Cubana en el 2000: Desempeño Macroeconómico y Transformación Empresarial (La Habana: Centro de Estudios de la Economía Cubana, Universidad de la Habana, April 2001), p. 14. 6. Raisa Pagés, “Foreign investment consolidating in Cuba,” Granma Internacional Digital (January 24, 2002). 7. Raisa Pagés, “Ascienden a 270 contratos de producciones cooperadas,” Granma Internacional Digital (February 3, 2003). 8. Official balance of payments data from Anuario estadístico de Cuba 2002 (La Habana: Oficina Nacional de Estadísticas, 2003) and earlier issues. 9. The Anuario estadístico de Cuba 2002 contains information on the balance of payments for 2001 but does not update it to 2002. 10. Juan Triana Cordoví, “La economía cubana en el 2002,” Octavo Seminario Annual de la Economía Cubana, La Habana, Centro de Estudios de la Economía Cubana, February 2002, p. 10. 11. This information is cited in “Foreign Investment and Cuba,” U.S. Cuba Trade and Economic Council webpage, www.cubatrade. org. 12. “Foreign Investment and Cuba,” U.S.-Cuba Trade and Economic Council webpage, www.cubatrade.org. 13. UNCTAD, World Investment Directory—Volume XI: Latin America and the Caribbean 2004 (Geneva: UNCTAD, 2004). 14. Omar Everleny Pérez Villanueva, “La inversión extranjera directa en Cuba: Peculiaridades,” mimeographed, 1998. 17. Raisa Pagés, “Business with China in nickel, rubber and oil prospecting,” Granma Internacional Digital (January 26, 2004). 18. Mining arrangements with foreign partners can take the form of risk sharing contracts or joint ventures. See Omar Everleny Pérez Villanueva, “Foreign Direct Investment in Cuba: Recent Experience and Prospects,” in Pedro Monreal, editor, Development Prospects in Cuba: An Agenda in the Making (London: Institute of Latin American Studies, University of London, 2002), pp. 59-60. 19. 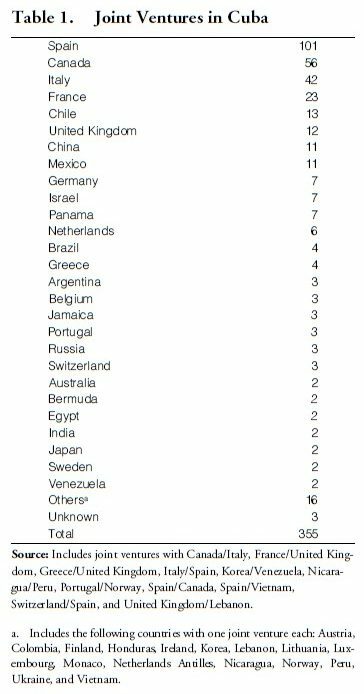 Note that the cumulation of JVs by country in Table 1 yields 355 rather 344 entries; this is so because 11 of the JVs have foreign partners from two countries. See the note to Table 1. 20. In a BOT (build-operate-transfer) arrangement, a private firm constructs a project (e.g., a new dam, a water treatment plant, or a power plant) in a foreign country, operates it for a set number of years, and at the end of the contract period relinquishes all rights to it to a company in the host country, typically a public utility company. 21. The Cuban government gave several reasons for the policy shift: (1) the new units were competing with the tourism industry; (2) Havana’s basic infrastructure of public services (water, sewage, electricity) could not support the large number of new unit being planned; and (3) many of the buyers of apartments had no obvious connection to Cuba (and therefore were probably buying them for speculative reasons), while the rationale for authorizing real estate investment was to address the housing needs of businessmen and other foreigners living in Cuba. Another reason, not mentioned by the government, was the obvious inequity whereby a foreigner could buy an apartment while a Cuban citizen could not do so. See Mauricio Vicent, “Los tropezones cubanos del capital extranjero,” El País (July 24, 2000). 22. In April 1995, CITEL sold 25 percent of its interest in ETECSA to STET, a subsidiary of Italy’s government controlled telephone company Telecom Italia S.A.
23. The database contains only 3 CP contracts in the textiles/apparel area: one with a Mexican company to produce and market yarn, a second CP contract with an Ecuadorian company to produce casual apparel for the domestic market, and a third CP contract with a German company to wash blue jeans using German and Swiss commercial laundry equipment. The relative absence of CP contracts in the textiles/apparel area probably reflects the lack of access of apparel items produced or assembled in Cuba to the U.S. market, by far the largest importer of textiles/apparel products in the region. 24. “SuperClubs bows to US pressure,” Jamaica Observer (June 17, 2004); see also Pablo Bachelet, “US sanctions on Cuba force Jamaica company pullout,” Washington, Reuters (June 15, 2004). The two hotels in question are the Brisas Costa Verde, near Holguín, and the Gran Lido Varadero. 25. In addition to the two hotels for which SuperClubs has reportedly relinquished management, SuperClubs also managed three other hotel properties in the island, the Brisas Jibacoa, the Brisas Varadero, and the Brisas Cayo Coco. It has been reported that SuperClub has also withdrawn from the management of the Brisas Varadero. See “Se va una firma turística jamaiquina,” El Nuevo Herald (June 17, 2004). 26. Simon Romero, “Spanish Seek Oil Off Cuba,” The New York Times (July 6, 2004).